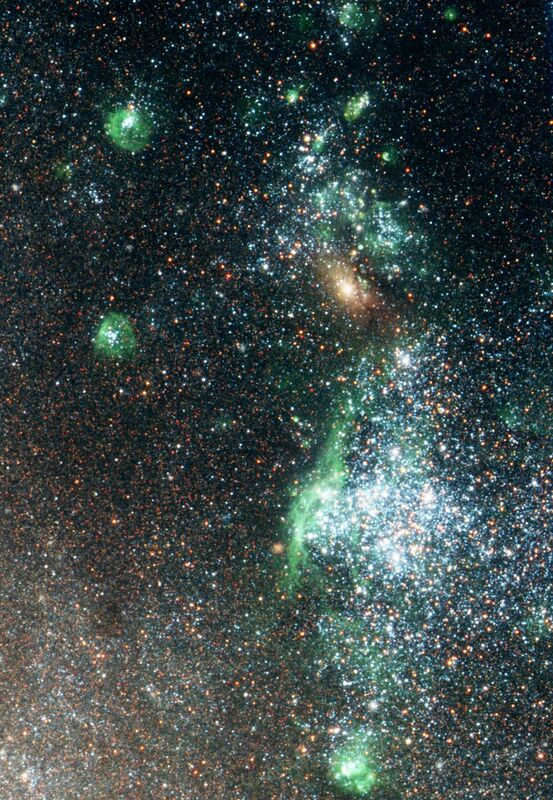 Astronomers using Hubble Space Telescope have found that young stellar nurseries, called open star clusters, have very short lives. Hubble's Advanced Camera for Surveys gleaned these new observations during a "Where's Waldo" search for blue stars tossed out of their open cluster "nest" in the nearby galaxy known as NGC 1313. Only Hubble has the resolution needed to distinguish individual stars in galaxies at NGC 1313's distance, about 14 million light-years. Astronomers have long known that young or "open" star clusters must eventually disrupt and dissolve into the host galaxy. They simply don't have enough gravity to hold them together, unlike their much more massive cousins, the globular star clusters. Before Hubble, astronomers have had very few observational clues. It's been difficult to observe exactly how star clusters dissolve due to the fact that they are easily lost in the cluttered star field background of the host galaxy. 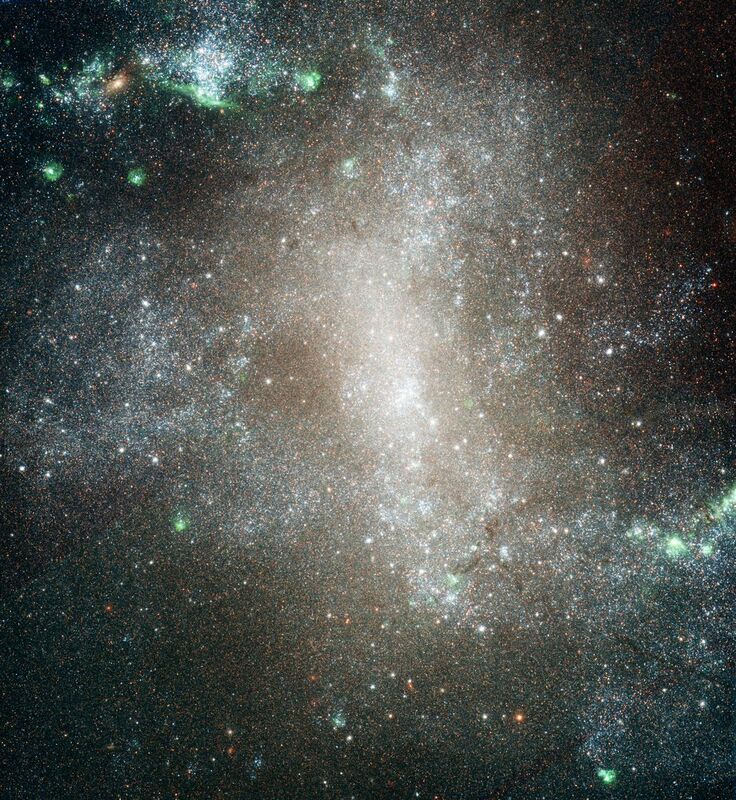 A team led by Anne Pellerin of the Space Telescope Science Institute in Baltimore used Hubble to observe the barred spiral galaxy NGC 1313 and found that a large number of very young massive blue (B-type) stars are not associated with compact star clusters anymore. B stars burn out quickly due to the quick rate at which they use up hydrogen fuel. Because B stars have very short lives (a few tens of millions of years), the presence of a large number of massive B-type stars suggests to astronomers that star clusters may dissolve very rapidly, within 25 million years. This is brief compared to the lifetime of the galaxy, which is measured in billions of years. The rapid disintegration of open clusters is reinforced by the fact that the team found that the B stars are significantly more spread in the galaxy than even the more massive O-type. The O stars are so short lived (a few million years or even less), they explode as supernovae before they can be scattered outside the cluster. In fact, the supernovae explosions of O stars could be the reason for a cluster's rapid disintegration, say researchers. Supernovae are capable of blasting out residual dust and gas from star formation inside a cluster. This could abruptly leave an open cluster with too little mass to gravitationally hold together for very long. In this scenario, the cluster stars drift off as other stars in the galaxy gravitationally tug on them. Previous research based on the Hubble images of the Antennae galaxies, a colliding pair of galaxies, showed that 90 percent of the clusters are dissolved in this way during the first 10 million years of their existence. However, NGC 1313 is the first example of this happening in a normal spiral galaxy. By using the analogy of star formation in open clusters in NGC 1313, we can infer that stars formed in a similar manner in the Milky Way, and so can help us better understand the way the Sun was formed.